Dominic Cummings & Vote Leave wussed out of a winnable fight. Dominic Cummings and Vote Leave wussed out of a very winnable fight against the PM yesterday. They conceded the ground like the snivelling cowards they are, afraid to confront the PM on his most blatant lies. This is mostly because Dominic Cummings isn’t intellectually equipped to understand such a things as a strategy and instead left the goal wide open for Lying Lucy Thomas to ask roughly the same questions we would ask. Which fictional free trade agreement is this Dom? Is there a real world example outside the realms of your imagination? The real matter of course is that Cummings is a Tory after all – and breaking ranks and running a proper campaign would have meant calling the PM and liar and undermining his credibility. You won’t catch one of the Tory inner circle doing that. Fortunately, we Norths will because we never back down and we’ve always hated Toryboys. They are cowards and they are not to be trusted. Meanwhile Leave.EU, as we see above, has fallen into the trap too. So really, it looks like it is as we always thought it would be. We’re left to make the running with the only Brexit plan worth talking about and the best team of bloggers on Twitter. Cummings doesn’t own the space and nobody sane watches Newsnight so who honestly cares what the part timers say? As we have noted about a billion times, it doesn’t matter that the Norway Option is sub-optimal because it is a stepping stone as part of the Brexit process – thus none of the petty complaints really apply. It still offers the best reassurances that will likely secure a win vote. 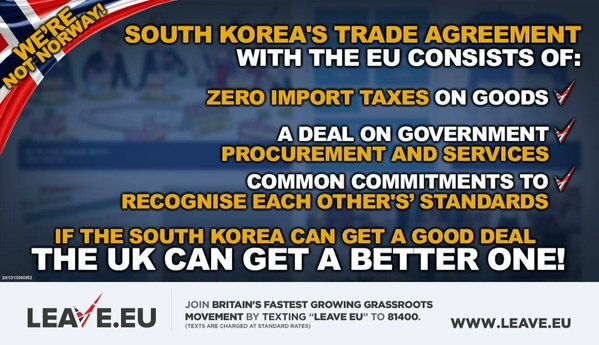 So what if the not yet official leave campaign can’t get their tiny brains round it. We’ll just take a leaf out of British Influence’s book and carry on as if they’d never said a word. They ignore us, we can ignore them. As for the europhiles, they’ll say Vote Leave has disowned the Norway Option. Our reply is that they have not received the nomination, they are not the lead campaign and they are every bit a one man band as Ukip. The voice of Vote Leave is the voice of Dominic Cummings, nobody elected him, and he speaks only for himself. We couldn’t give a tinkers damn what they say. Nothing they have even touches Flexcit. As for the morons who retweet their memes, they’re just noise and they’re not the votes that matter. Our mission is still the same – to reach those voters an airheaded campaign like Vote Leave never could in a billion years of trying. there is of course the undeniable fact that David Cameron is their boss and individuals like Dominic Cummins, Matt Elliott, Owen Paterson and many others in the myopic Westminster Bubble of the cranno rectally retentive mutually congratulatory cult are in the long term dependent on his largesse and access to control of the public purse. It is unlikely that anyone in the Westminster Bubble or body politic can be trusted to lead or influence a campaign to Leave-The-EU. It is increasingly clear that those in the bubble have little understanding of just what The EU is besides a Politicos Gravy Train and even less understanding of how the public feel about it, as for many years Westminster has tried to curry favour by talking down Britain and the wishes of our peoples. You make the point well – DC is at heart a Tory boy – period! You’re right. If Cummings is the best Vote Leave have to offer they are in trouble. Next Next post: Just Why Do David Cameron His Predecessors & Allies Lie About The EU?